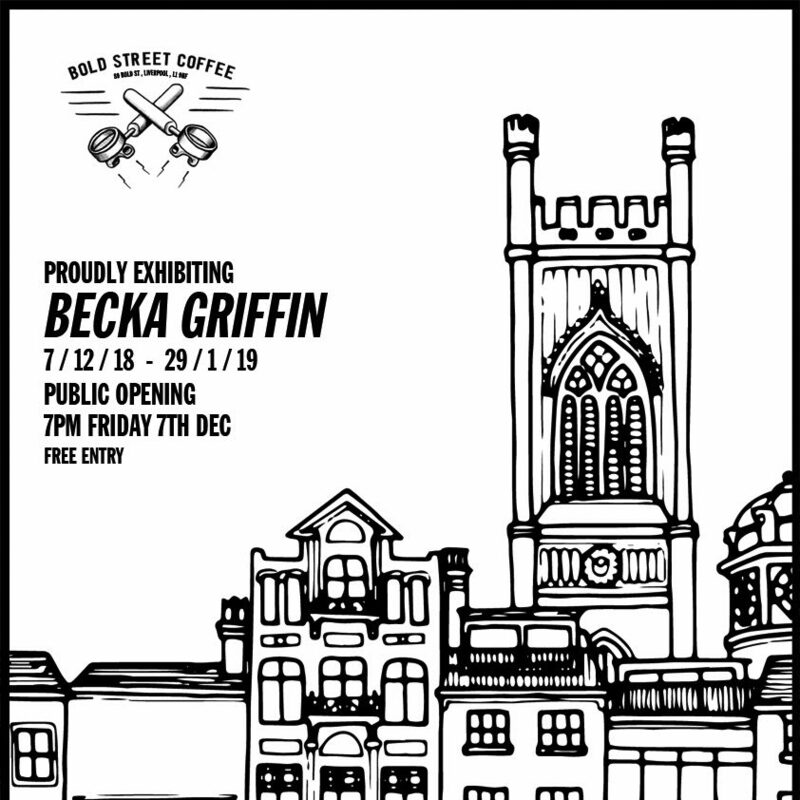 A special exhibition celebrates the relaunch of Bold Street’s favourite coffee shop, and local artist Becka Griffin’s much loved collection of pen and ink drawings of various cityscapes. The exhibition launches with an evening event on 7th December 2018, between 7-10pm, at the newly-reopened Bold Street Coffee. Liverpool-based Becka has been drawing architecture and buildings for years, and embarked on her latest series of illustrations only two years ago, creating beautiful skylines of cities across the UK, gaining attention from national media including ITV’s This Morning and Ethos Magazine. This is the first time Becka has exhibited so many of her skyline creations in the same room – with around 50 illustrations – including her brand new Bold Street drawing, created especially for this event. The process Becka uses to research each image aims to achieve a relevant and contemporary, yet recognisable, snapshot of each location. She starts with an appeal via her social media for people’s ideas of the most memorable landmarks in each city, and then uses a tally mark system for voting. The 8-10 most popular landmarks make it into the final image – which is then carefully planned out and then drawn by hand using a selection of black fineliner pens. The resulting image is then recreated as a greetings card, a print or, in several cases, a huge wall vinyl. Including little touches like a hot air balloon for Bristol, or Lincoln’s Red Arrows, gives a touch of personality to each drawing. Becka’s favourite skyline is her pretty Lake District illustration, featuring Derwentwater, Keswick Pencil Museum and – of course – some mountains. “I grew up in the Cumbria,” she says: “so it’s always going to be close to my heart”. The exhibition launches at Bold Street Coffee on 7th December and runs until 29th January 2019. Becka will have some prints available for purchase in Bold Street Coffee, but work can be also be bought online via her website, Etsy and notonthehighstreet.com.